WordPress is a versatile and functional content management solution that has slowly become the most popular website software in the world. More websites run on WordPress than any other solution, making it easy to find a large variety of plugins, add-ons, themes and other customizations. Unfortunately, unoptimized WordPress installations are known to be slow and laggy, which can truly harm your website’s long-term potential. A faster website is a more visited website, so you’ll want to ensure you’re running as smoothly as possible. Today, let’s talk about some straightforward solutions for speeding up your WordPress website. WordPress runs on a dynamic system, meaning that each instance of a page by default is generated at the time someone visits it. Unfortunately, this can slow down overall page speed. If you’re not constantly changing most of your pages, then you may want to consider a WordPress caching plugin to get around this. Instead of delivering a super-fresh instance of the page each time it is loaded, the caching plugin will serve a recent but cached version of the page to users. This can dramatically improve page speed and is often cited as the number one way to ensure people are pinging your website with virtually no wait time. Search engines love fast pages and most caching plugins are free, so you have nothing to lose by installing one. Another great way to improve page load speed is to reduce the size of the biggest single element: images and photos. Between website logos, blog content and a variety of other images, you can suddenly be pushing several megabytes of data per page through your hosting provider and onto the visitor. By using an image optimization tool or plugin, you can drastically reduce overall file size without compromising picture quality. The smaller the combined contents of any page, the faster it loads: it can’t get any simpler than that. It’s definitely worth the time to do this, especially since a plugin can do it for you automatically in a matter of minutes. If you’re the type who doesn’t update your WordPress installation and plugins regularly, then you’re begging for a slower site. As new updates are release, older versions become less compatible when combined with new features and additions. Ignoring the fact that not updating your installation and plugins can cause security concerns, your site will gradually become slower, with more people who are pinging your website deciding to look elsewhere for what they need. Don’t lose traffic over a bit of laziness: you can even configure WordPress to update automatically if you haven’t done so already. 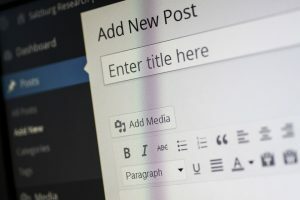 With just three simple changes and additions, you can drastically improve the speed of your WordPress website and ensure that visitors are happy with what they see. By reducing file sizes, using caching and always updating, you’ll be sure to never lose potential customers and visitors to slow loading times. Have you done anything else to speed up your site? Let us know below if you have. « Which Marketing Tools Are Best Right Now?